On May 12, Brazil’s democratic government, led by the Workers’ Party (PT), was the victim of a coup. What will the other BRICS countries (Russia, India, China, and South Africa) do? Will they stand by as the reactionaries who took power in Brasilia pivot closer to Western powers, glad to warm Dilma Rousseff’s seat at the BRICS summit in Goa, India in five months’ time? Or take a stronger line, following the lead of Latin American progressive countries (Venezuela, Cuba, Ecuador, Bolivia, Nicaragua and El Salvador)? Here in South Africa, few expect Jacob Zuma’s African National Congress (ANC) government to react constructively on the international stage. Making waves isn’t likely at a time when Standard & Poors and Fitch are on a South Africa visit, deciding whether to downgrade the country’s credit rating to “junk” status, as happened in Brazil late last year. This is a shame because the last two weeks have offered excellent opportunities for diplomatic rebellion: revelations have emerged implicating the Central Intelligence Agency (CIA) in assisting the apartheid state’s 1962 arrest and twenty-seven-year imprisonment of Nelson Mandela. This isn’t exactly surprising; the State Department did keep Mandela on its terrorist watch list until 2008. South Africa’s chief foreign policy spokesperson Clayson Monyela responded to Kodwa’s accusation with assurances that South Africa’s relations with the United States “are strong, they’re warm, and cordial.” But Kodwa’s cry of imperialism, in light of the Brazilian coup, has struck a nerve. Indeed, the argument that Rousseff’s ouster demonstrates that the purportedly anti-imperialist BRICS are under sustained attack by U.S. empire is being repeated in a number of corners. Commentators like Eric Draitser, Pepe Escobar, Paul Craig Roberts and Hugo Turner, along with officials from Venezuela and Cuba, all make this claim. coup was a product of imperialism, as Zondi and many others argue, requires a bit more circumspection. Indeed, we witnessed a similar problem here in South Africa, with the country’s then lead spy, Moe Shaik, offering the same sort of tell-all function – before becoming a key liaison to the BRICS New Development Bank. She repeated this when pressed by the interviewer, so it was crystal clear that she blames the old oligarchs for her downfall. This point was reinforced by subsequent revelations about the coup plotters’ local motivations, to avoid their own prosecution for corruption. international credence to the local capitalist elite’s coup against a progressive democrat. Similar concerns about Obama’s role on the African continent have also been expressed – appropriate considering the Africa Command’s agenda. But the role of the BRICS countries shouldn’t be downplayed in these geopolitical power plays. repeated U.S. incursions in Honduras, Haiti, Afghanistan, Libya, Syria, and Ukraine (and one might add Paraguay too). Yet, despite this impressive list of imperialist interventions, U.S. “regime change maneuvers in the rest of the black world,” as Zondi phrases it, are not that common. They are not needed at the moment, especially in Africa, where the local leadership is already supine when it comes to Washington’s agenda. Simply put, “racism, crude capitalism and patriarchy” associated with twentieth-century U.S. imperialism have been largely replaced by Obama’s neoliberal multilateralism – a style of governance that the BRICS have bought into, not opposed. This isn’t something to celebrate. Multilateral neoliberalism leaves the BRICS countries far less able to pursue any positive South-South interventions. last week by Temer’s foreign minister, José Serra, plus Brasilia’s renewed neoliberal agenda on the home front, suggest this will be the case. from Edward Snowden that Obama had bugged her phone and email). “Brazil has spoken out on the agenda of decent work, food sovereignty, a greater Western contribution to the global response on climate change, ecological justice and the end to ecological imperialism. Brazil has also been an advocate of the responsibility to protect. Many South Africans are impressed with the BRICS, but the reality of Brazil’s global maneuvering is much less rosy. In the most important multilateral settings, BRICS elites have worked against the interests of the world’s majority and against the environment. Consider Brazil’s actions in the International Monetary Fund (IMF). Since 2010 it has been working to reconfigure voting power (“voice”) in the institution. It has successfully increased its vote by 23 per cent (with China also up 37 per cent, India up 11 per cent and Russia up 8 per cent). Yet the U.S. still won’t give up its veto power – it is the only country with more than 15 per cent required – and the BRICS’ total vote is now just 14.7 per cent. Worse, the restructuring deal that made this rise possible was detrimental to African countries: Nigeria just lost 41 per cent of its voting power, along with Libya (39 per cent), Morocco (27 per cent), Gabon (26 per cent), Algeria (26 per cent), Namibia (26 per cent) and even South Africa (21 per cent). From this perspective “BRICs versus Africa” seems a more apt way to describe Brazil’s role in “reform of global governance” at the IMF. 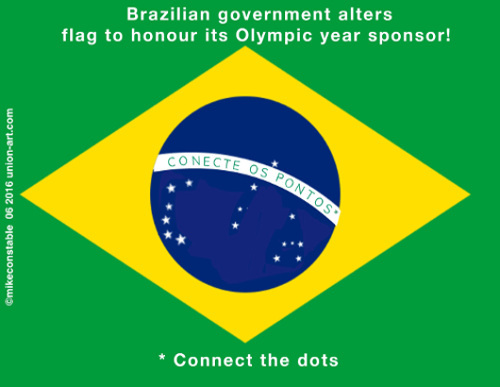 Brazil’s maneuvers at other global governance institutions – including the World Trade Organization (WTO) which is currently headed up by Brazilian Roberto Azevêdo – are equally damaging. According to the ordinarily pro-BRICS NGO Third World Network (TWN), Brazil conspired with the United States and the European Union at the WTO to “[ensure] that India did not get the language it proposed” to maintain vital food subsidies, which in coming years will lead tens of millions of Indian peasants to suffer. As TWN’s Chakravarthi Raghavan put it, “on the eve of Nairobi, Brazil unilaterally abandoned the G20 alliance to join the U.S. and EU, in trying to act against China and India,” not to mention against the world’s poor. Of course, Brazil’s behavior is not unique. China and Russia persistently block efforts by Brazil, India, and South Africa to permanently join the Security Council. The point is simply that intra-BRICS solidarity, let alone broader South-South solidarity, is hard to find in reality. The issue of Brazil’s role in battling the global environmental crisis also deserves greater scrutiny. In 2009 Lula supported – alongside the United States, India, China, and South Africa – the Copenhagen Accord, which voided the Kyoto Protocol’s binding emissions-cut premise, contained utterly unambitious emissions targets, and also wrecked the UN process that year. UN climate deal, a deal which assures catastrophic global warming and also now legally prevents climate victims in the Global South from suing the Global North for its climate debt. “The UN occupation of Haiti is really a U.S. occupation – it is no more a multilateral force than George W Bush’s “coalition of the willing” that invaded Iraq. “And it is hardly more legitimate, either: it was sent there in 2004 after a U.S.-led effort toppled Haiti’s democratically elected government. Far from providing security for Haitians in the aftermath of the coup, [the UN mission in Haiti] stood by while thousands of Haitians who had supported the elected government were killed, and officials of the constitutional government jailed. Meanwhile back in Johannesburg, lefty-sounding rhetoric from the ANC’s Luthuli House is nothing more than politicians blowing dust into the air. When ANC leaders call the courageous South African public protector Thuli Madonsela a “CIA agent,” or declare that the Mandela Washington Fellowship program of the U.S. Embassy is training kids for “regime change,” they show off anti-imperialist feathers. But in reality, Washington has no beef with Pretoria. The ANC has always excelled at talking left while walking right. An earlier version appeared at Jacobin . Patrick Bond teaches political economy at the University of Witwatersrand in Johannesburg. He is co-editor (with Ana Garcia) of BRICS: An Anti-Capitalist Critique .